A confirmation email is sent immediately after booking. The buyer of the order will receive all Tickets in the order as well as the Order Receipt. If another email address is entered for an individual Ticket in an order, a confirmation for the individual Ticket(s) will be sent to that email address as well. Confirmation emails contain the Tickets in the body of the email and in the attached PDF. 1. Login to your Buzz Account using the email address associated with the order. If you do not remember your password, you can reset it here. 4. 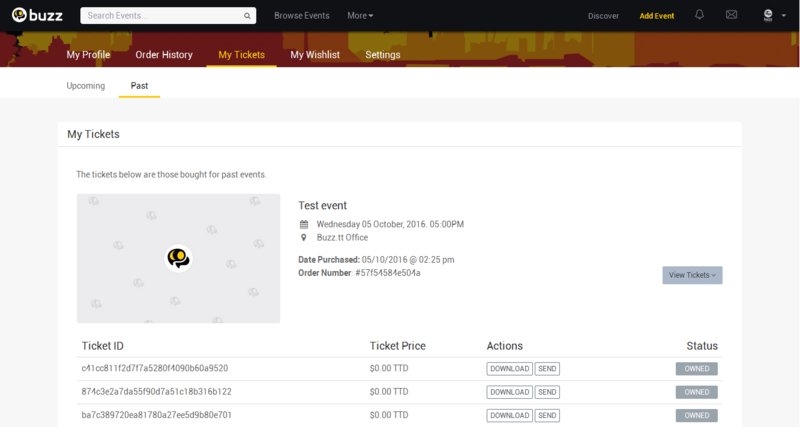 On your My Tickets page, all tickets and order information for upcoming and past events associated with your account will be shown. To view specific Ticket or Order Information, select the View Tickets button beside the item you'd like to view. Note: If you are the buyer of the order, you'll have access to all Tickets in the order, Order Information, and the Order Receipt. If a Ticket in an order is associated with your email address but you are not the buyer, any Ticket associated with your account will show on your My Tickets page, and any additional Tickets in the order and the Order Information and Order Receipt will not be shown. Tickets can be printed or displayed electronically unless specified otherwise by the Event Organizer. 1. Print Tickets: You can print the PDF sent in the Confirmation Email. You can also access this PDF in the My Tickets area of your Buzz Account by selecting Download next to the relevant ticket. 2. Show Ticket Electronically: You can display your Ticket(s) on any mobile device from those located in the body of your Confirmation Email, by downloading and using the Buzz App, or by adding your ticket to Apple Wallet using the link in your Confirmation Email. If you are experiencing issues locating your Tickets, please read this article.